Traditional grill food (i.e. BBQ stuff) doesn’t really tickle my fancy. Don’t get me wrong, I love me a good burger, potato salad, and watermelon, but I don’t generally crave it. Instead I’d prefer a stir fry dish, like this delicious Thai meal. 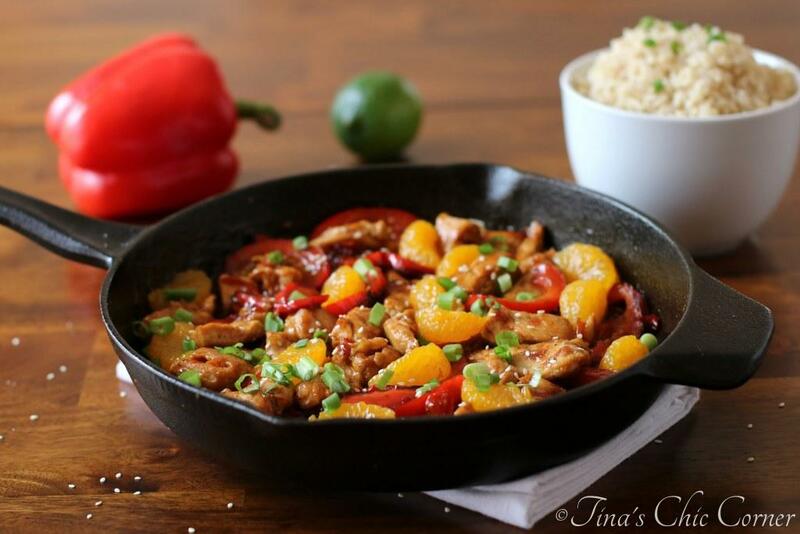 This stir fry contains chicken, red peppers, and mandarin oranges and it’s coated in a sweet and spicy Thai Chili sauce. Once the chicken is done cooking, remove it from the skillet. 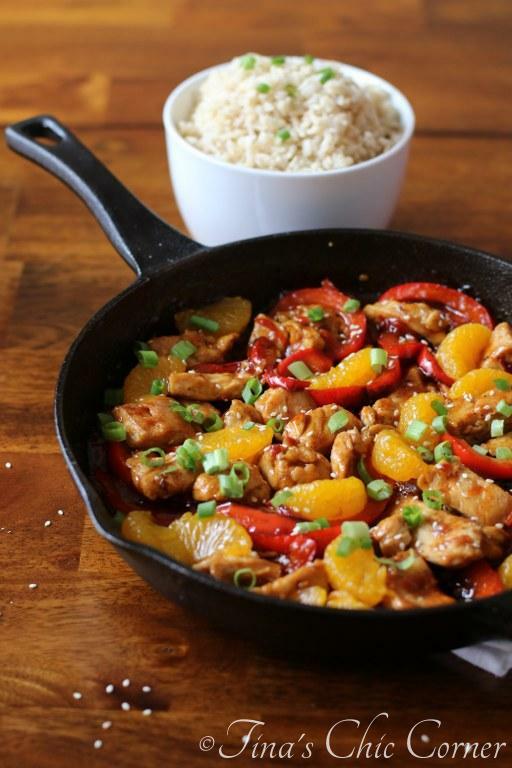 Heat the remaining 1 tablespoon of the sesame oil then add the sliced red bell pepper and cook it until it has softened and is slightly browned. Add the cooked chicken back into the skillet, along with the grated fresh ginger, Thai sweet chili sauce, soy sauce, ground cloves, cinnamon, and pepper. Stir all of the ingredients together and let it simmer for a few minutes. Plate the stir fry and top with sliced scallions and a sprinkling of sesame seeds. Using canned veggies or fruits are a neat trick if you can’t find the fresh real deal. Mandarin oranges are not in season by me right now so I opted for canned ones. They are still delicious and will do the trick (and are quite frankly tastier than the fresh ones anyway). These are added into the pan at the end because they are a bit fragile and stirring them with everything else tends to beat them up. You can find Thai sweet chili sauce in the Asian aisle of your grocery store (mine had a variety of brands to choose from). It’s a lovely combo of sweet and spicy flavors. This Thai sauce is the bomb digity though because I’ve kicked it up by adding some warm spices to it, like fresh ground ginger, cloves, and cinnamon. Sounds so Autumnal, doesn’t it? 😉 I must be inadvertently channeling my love for Fall food. 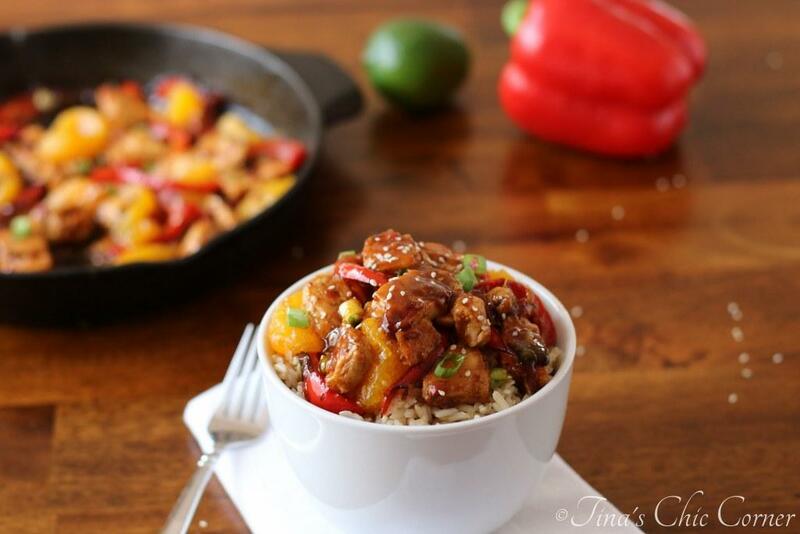 I’ve served this awesome stir fry over some brown rice. White rice or pretty much any other carb would work too. You could even skip the carbs if you wanted to make this a carb free meal. 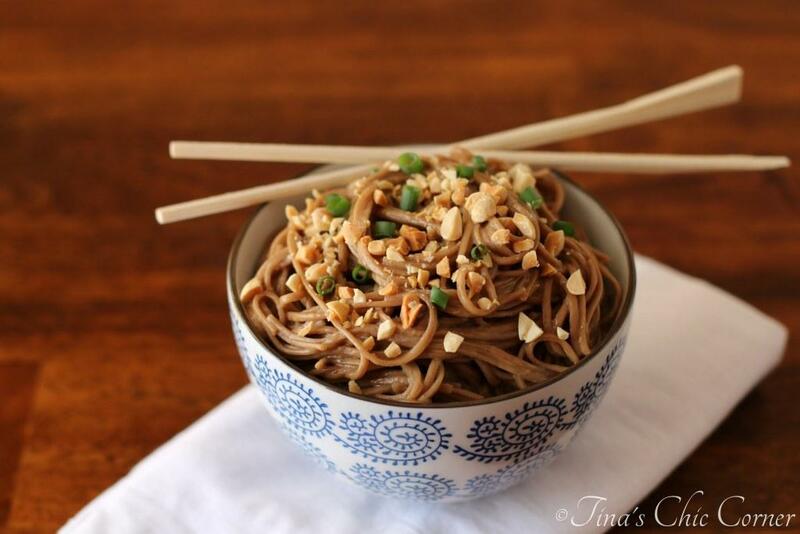 A great way to do that with Thai is with bean sprouts or cabbage. The sesame seeds and scallions add a nice crunch factor (and make it look lovely). You can also add a squeeze of lime on top to add a little tang to it. Are you a fan of grill food? Here are some other awesome meals. Really tasty looking dish. We love thai flavors in my house. Need to get around to trying this one day. I’ve only been into Thai cooking just recently and I’m loving it! 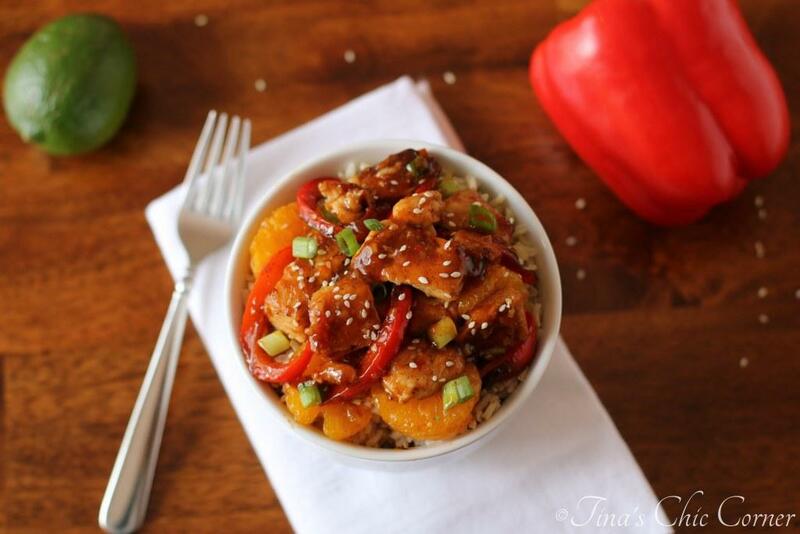 Stir-fries are one of my favorite weeknight dinner options! And I love that you have the oranges in here – I am a huge fan of citrus in dishes like this! Really interesting dish. Love your photo. I know stir frys and brown dishes are really difficult to capture but you did such a great job. This is added to my to-make list for sure, love it and so easy! 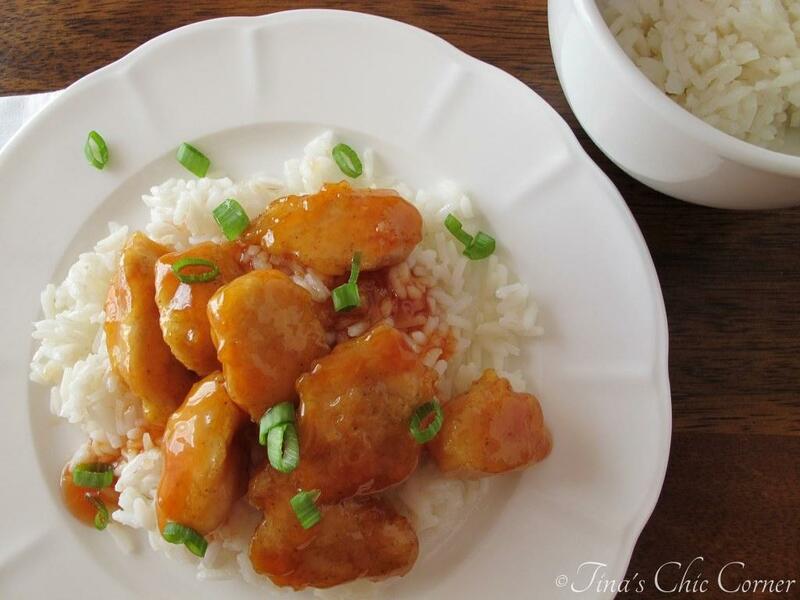 What a beautiful dish you made here Tina! Love all the flavor and the color is just lovely! I’ve been really into Thai flavors lately! Wow, this looks fantastic! 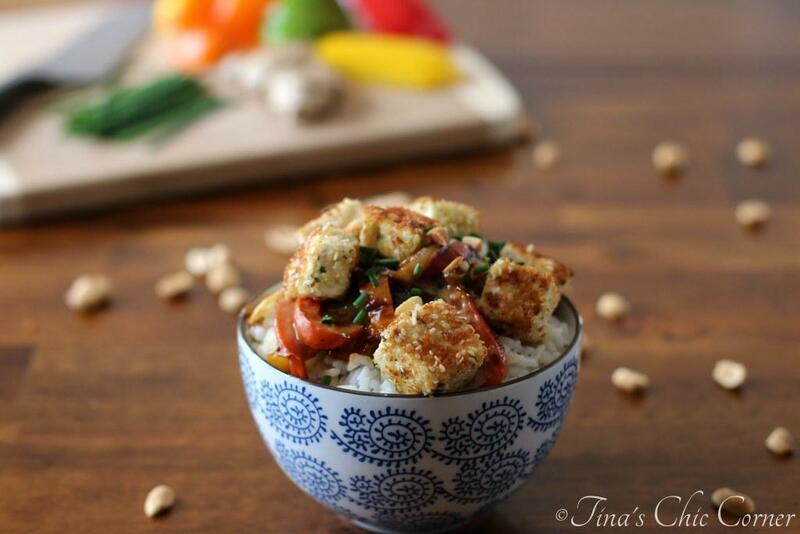 I love making stir-fry at home and I am loving this combination. I definitely need to give this one a try. Pinning! 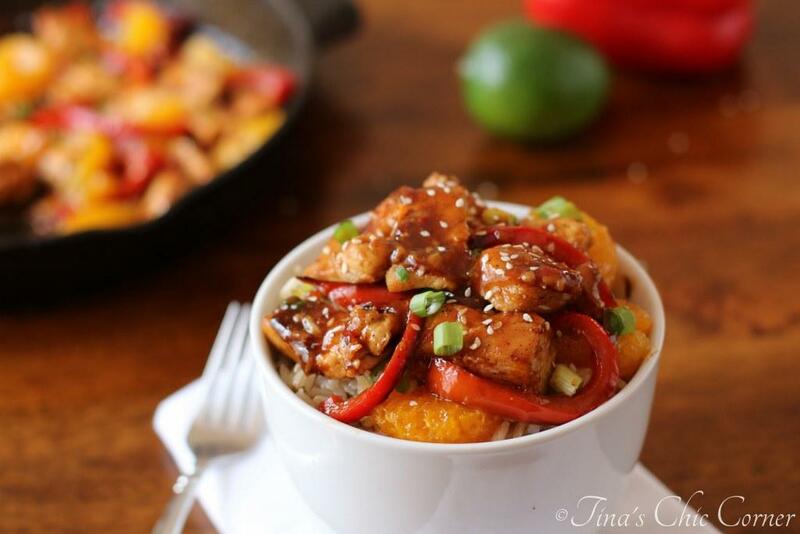 Stir fry meals are one of my favorite, so easy to throw together and tastes amazing! I love the pop of colors in your dish…definitely reminds me of summer! I would never have thought to use canned vegetables, do you think they taste good? Or do you feel like you are eating something that isn’t possibly containing much good for you? Would save a bunch of time, this is a great go to mid week recipe. I think it depends on the veggie and personal preference. In a perfect world, I love fresh, but living in CT, USA it’s not possible to get everything 365 days a year so I’ve learned to experiment when fresh is not available. For example I’d rather eat frozen peas, not canned peas. I think canned pineapple and citrus are great. Pictures are beautiful and colorful. I’ve never had Thai food, but I’d like to try this. I need to branch out and this looks like the one. My wife is a HUGE fan of stir fries. I’m totally going to have to make this for her. Thanks for a great recipe Tina! I’m with ya- I’m all about the stir-fry. I love a good BBQ every once in a while, but on a weekly basis, stir-frys are where it’s at! I can’t wait to try this with the oranges. It looks delish!